You bid us set the table Lord, and invite all to come. 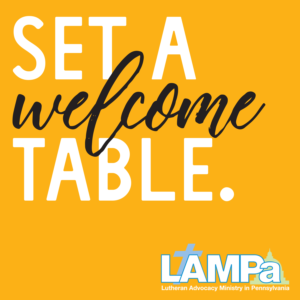 Inspire us by your Spirit to set a table where all are welcome and nourished, discover mercy, find justice and share in the riches of your grace. May our table be a place where we listen to one another, where divisions are healed and where we treasure the power of your grace. May we and all the world be fed. For all this we give you hearty thanks. Amen.